I gave this belated anniversary gift to my husband yesterday. 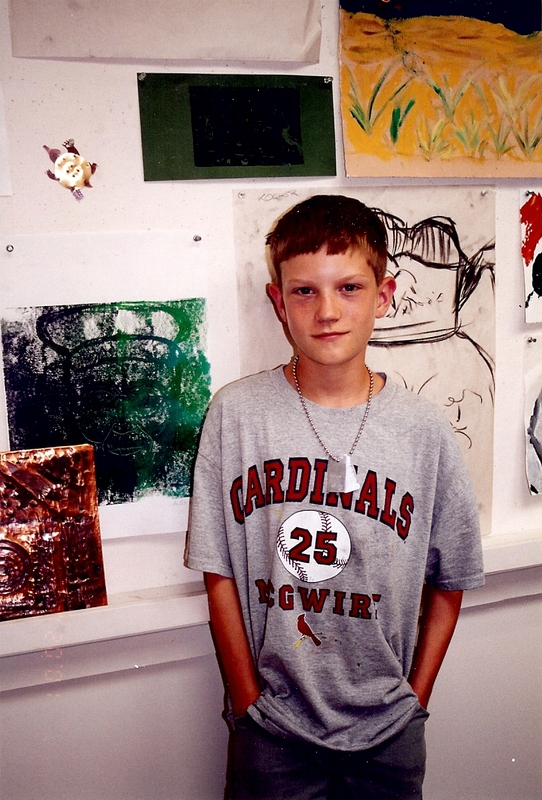 I bought the canvas in 2006, after the Cardinals won the World Series that year. I worked on it for a while, noticed I had made a mistake, and became frustrated because I didn’t want to fix it. I put it aside and forgot it. 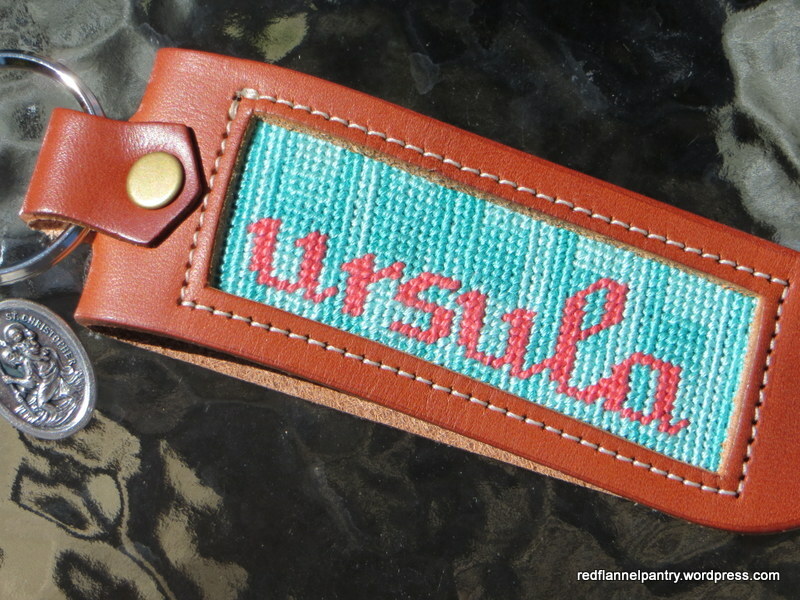 When I cleaned my sewing room in the spring, I came across the belt. With age and perspective (and a mellowing of my perfectionistic standards), I decided it would be silly not to finish it. The thing is, the Cardinals have since won another World Series (in 2011), so I had to squeeze in another baseball. 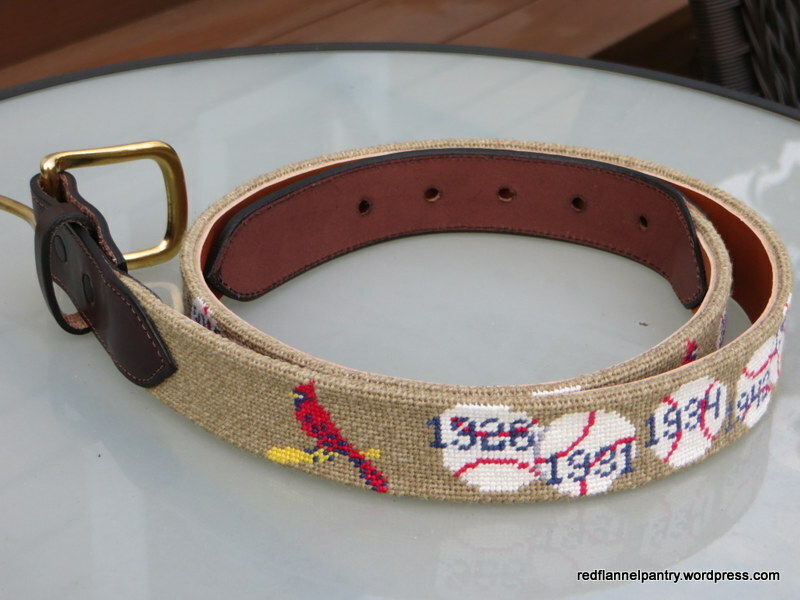 I became determined to get it done before the end of this baseball season because–you never know–they could win another World Series this year, and I wasn’t going to add any more baseballs! 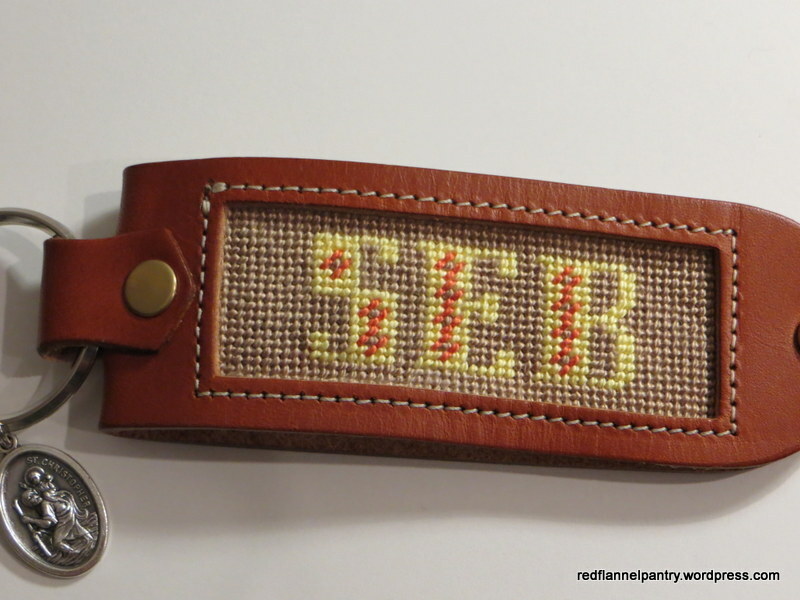 I used #5 DMC perle cotton on the design and two strands of slightly different colored wool to create the tweedy background. 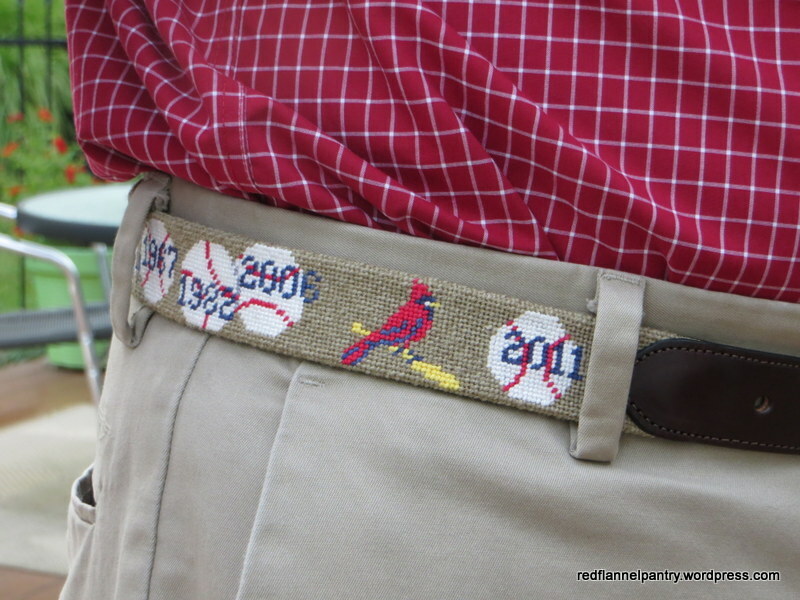 Needlepoint Clubhouse did the belt finishing for me. Last night the Cardinals, who have been struggling and in a slump, won against Cincinnati, rallying in extra innings to a 5-4 win. 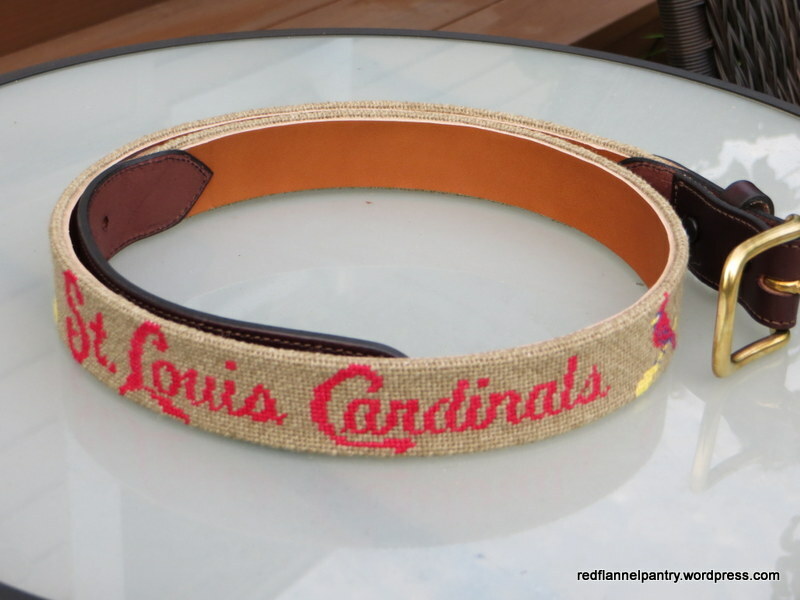 My husband is now calling it his lucky belt! Daughter #2 leaves early tomorrow morning with fellow St. Louis Zoo interns for Costa Rica, so we have spent the past few days getting her ready for departure. 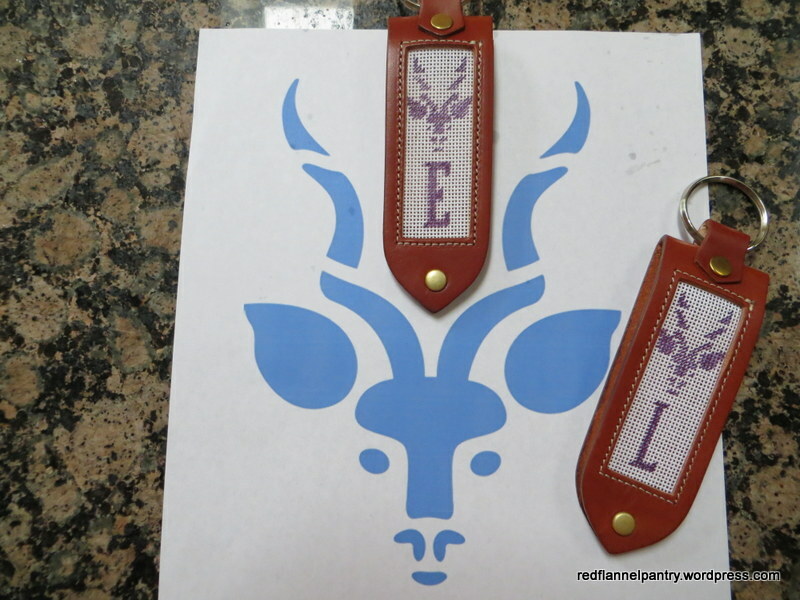 D#2 decided that she’d like to bring along some needlepoint to do, so we designed a couple of keychains as thank-yous for Eve and Laura, the patient Zoo educators who will be accompanying this posse. She plans to work on them during layovers and downtime. We incorporated the St. Louis Zoo’s logo, a stylized image of the male lesser kudu (a shy east African antelope) and the educators’ first initials. I am grateful to these wonderful professionals who are chaperoning this group of teenagers/young adults and enthusiastically sharing their knowledge and love of the environment, nature and animals. 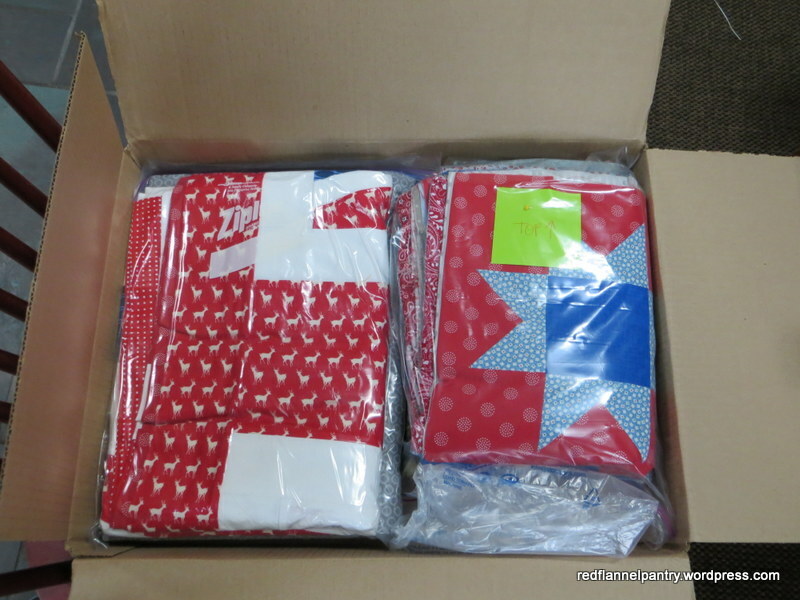 Although preoccupied with D#2’s travel preparations (and the associated worry), I did manage to get a couple of quilts mailed off to the quilter. Boy, did that feel good! 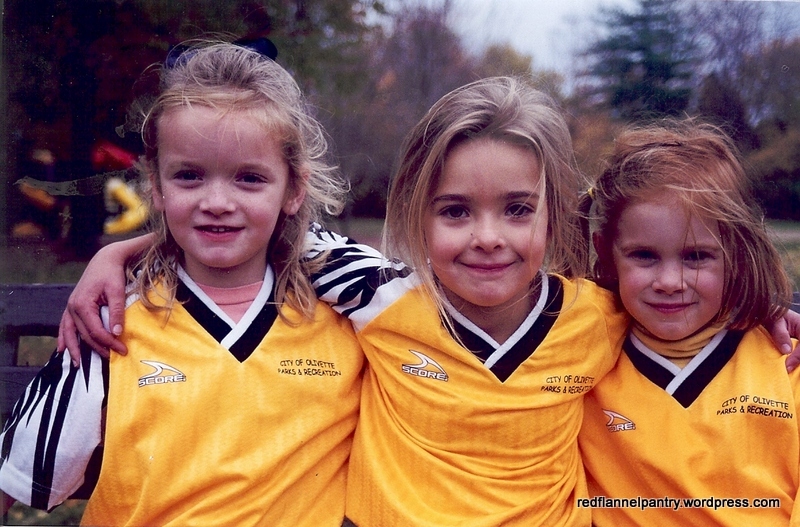 The birthday outlier among Daughter #2’s friends is turning 16 today–she is the last one in the group to join the legal driving set. 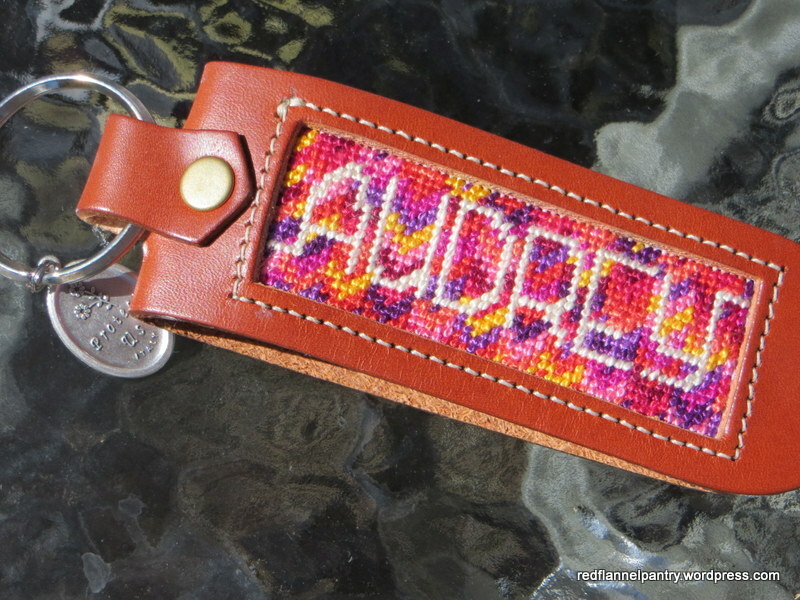 Inspired by the gorgeous mountain sunsets where she now lives in Colorado, D#2 and I chose a simple design for her keychain that suggests her new home. 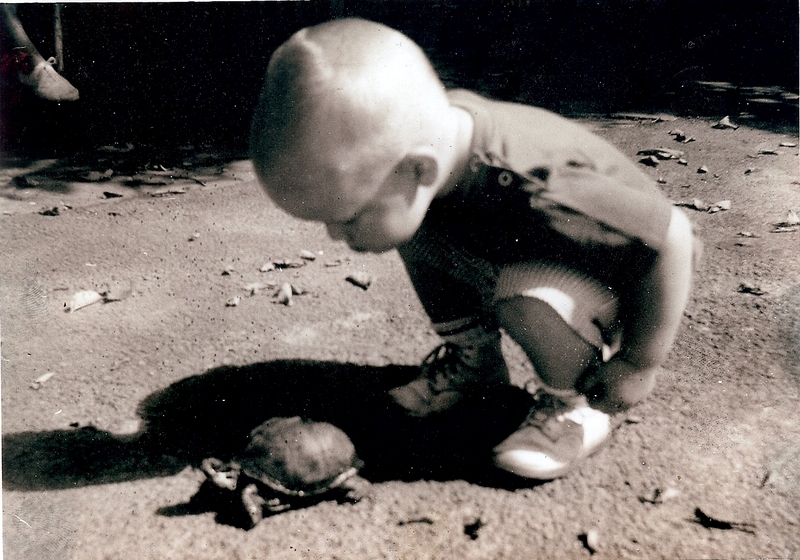 Since he was a little boy, my husband has been fascinated by turtles. 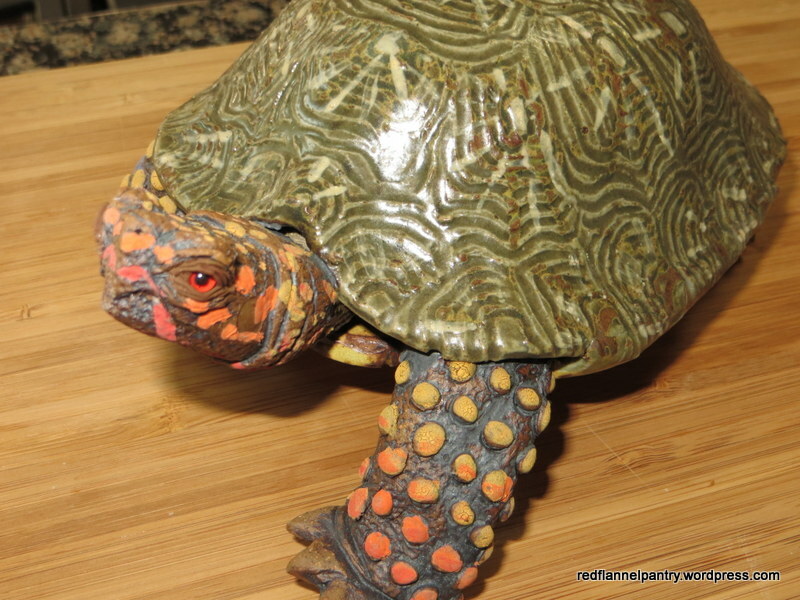 Sitting on a brick inside the turtle pool is one of several Missouri three-toed box turtles we have rescued from the highway over the years. We always release them to a nearby creek. 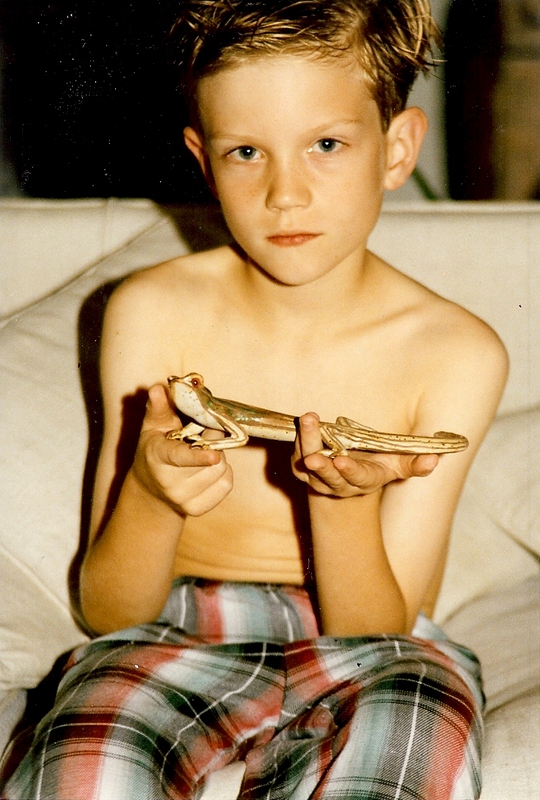 He passed this love of reptiles and amphibians on to our children. 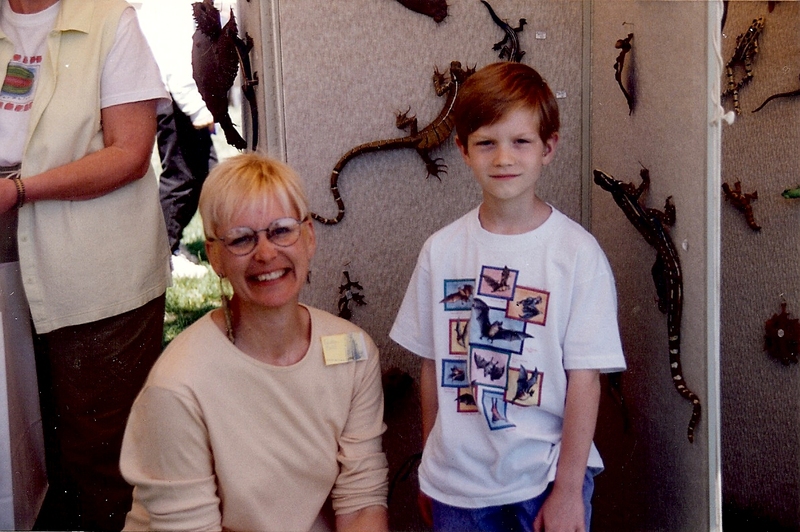 When Son #1 was 7, he met artist Karen Bell at an art fair. 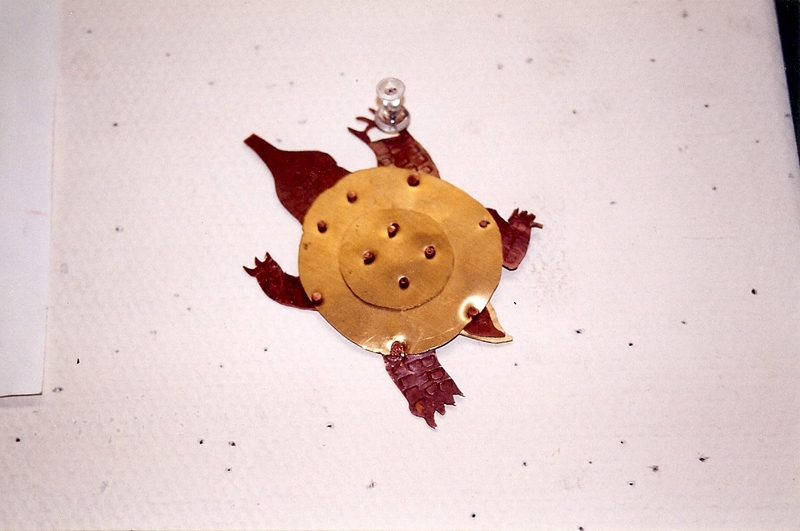 Karen is a sculptor and former art educator who creates sculptures of bats, turtles, frogs, toads, lizards, armadillos and insects in their habitats in glorious detail. She was kind and spoke to Son #1 at length. Son #1 was fascinated by her and her work and was determined to buy a sculpture. After a year of saving his money, he did. Son #1 is an artsy guy, a gift he inherited from his grandfather. Karen was inspirational too. See the turtle on the wall in the background? Son #1 is now a young man, studying art in college. We visit with Karen every time she is in town. 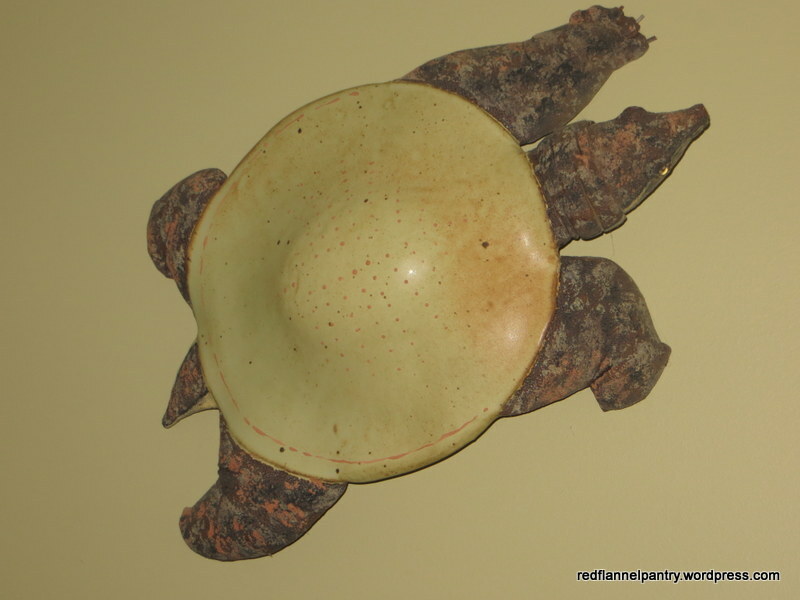 For my husband’s 50th birthday, I commissioned Karen to create a Missouri three-toed box turtle, like the ones his family had when he was a boy. He is a stunner. 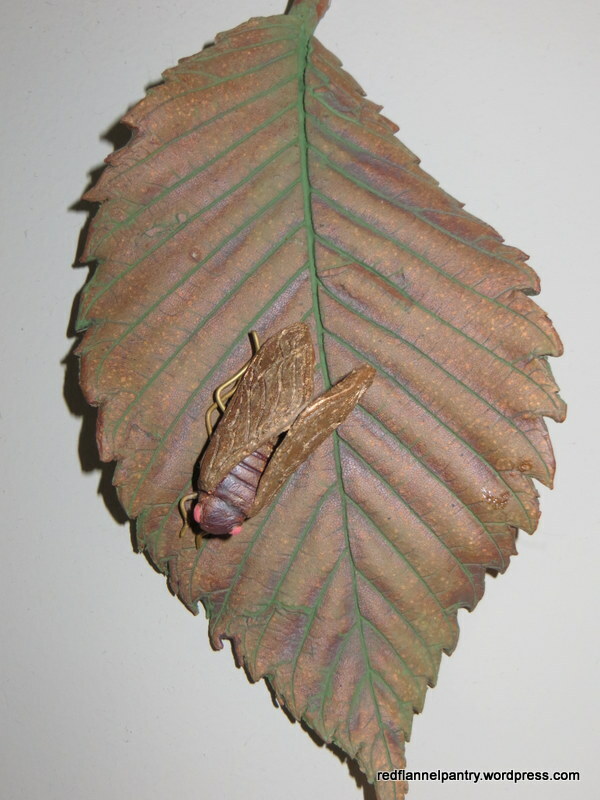 And Karen gave me this piece after I admired it and told her how our beloved dog, Carl, who died last year, used to eat cicadas on his summer walks. 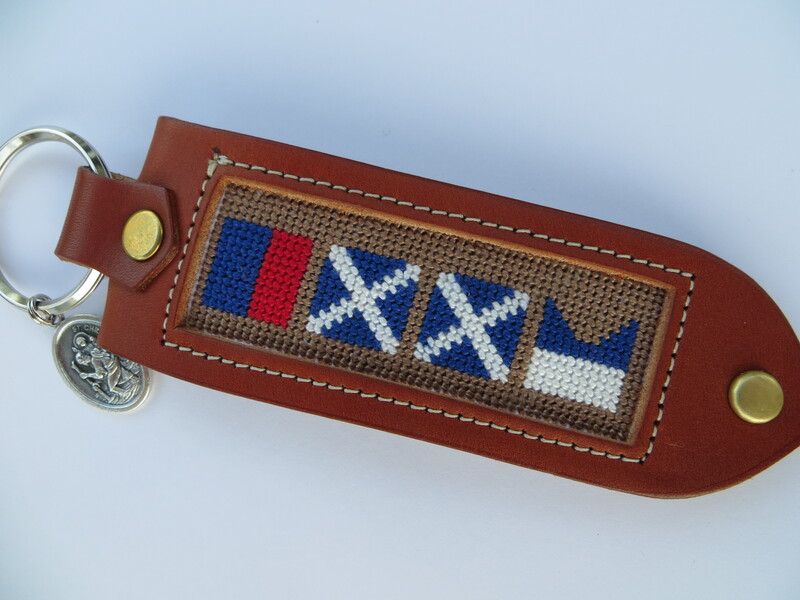 As a small thank you, I made this keychain for Karen. You can read about Karen in Sunshine Artist. She talks about her work and her evolution as an artist–and she even tells the story of meeting Son #1. It is remarkable how seemingly small moments can have a huge impact on one’s life. Our family’s meeting Karen was a small moment that led to a marvelous friendship. 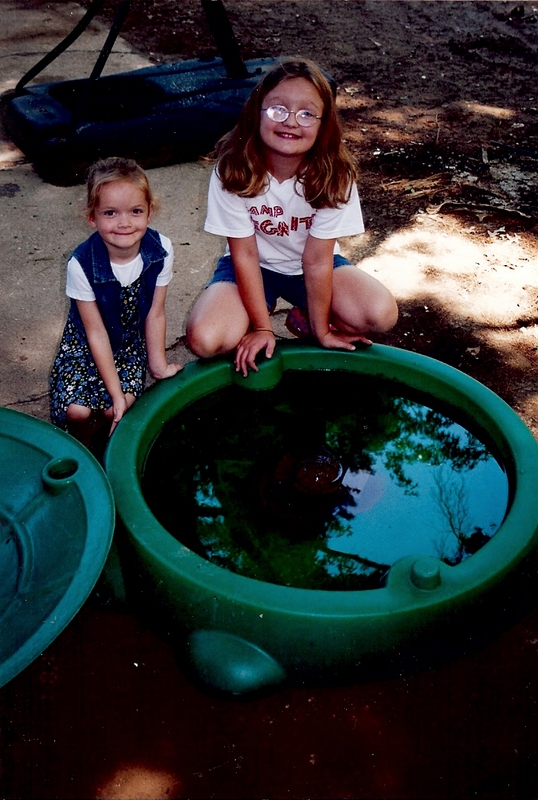 Yet another dear friend of Daughter #2 turned 16 this week. She and D#2 took driving lessons together, so they have a special automotive bond. 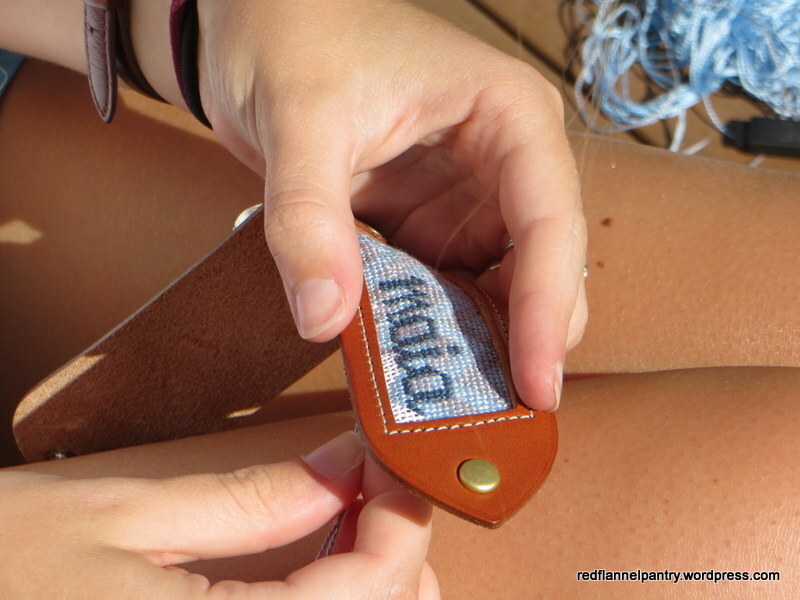 This friend is fond of nautical motifs, so D#2 and I thought it’d be fun to design a keychain spelling out her name in nautical flags. We decided to orient them vertically as if they were on a flag hoist. So these flags signal echo mike mike alta–EMMA! 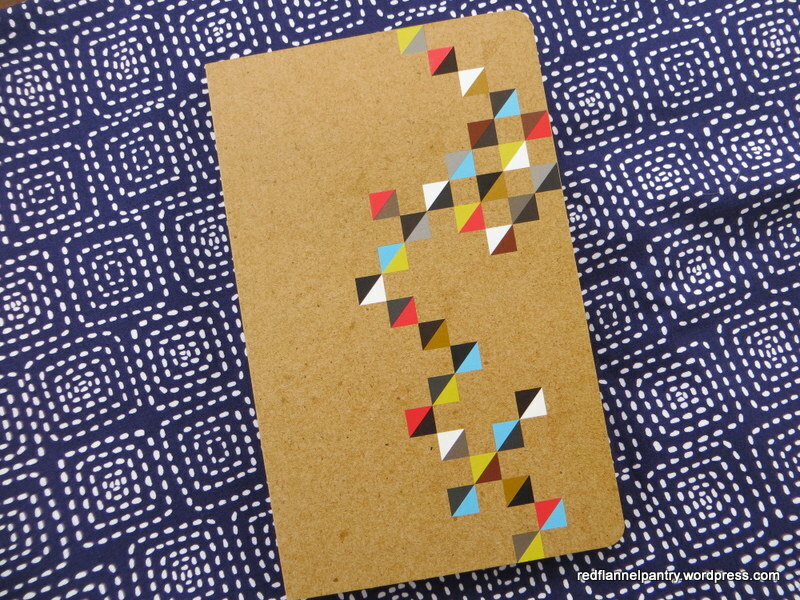 I found this little (5″ x 8″) journal at Target yesterday and couldn’t resist. I love the bright-colored floating half-square triangle (HST) blocks. The best part? It’s filled with graph paper, so it’s perfect for sketching needlepoint and quilt designs. Time to begin filling it up . . . 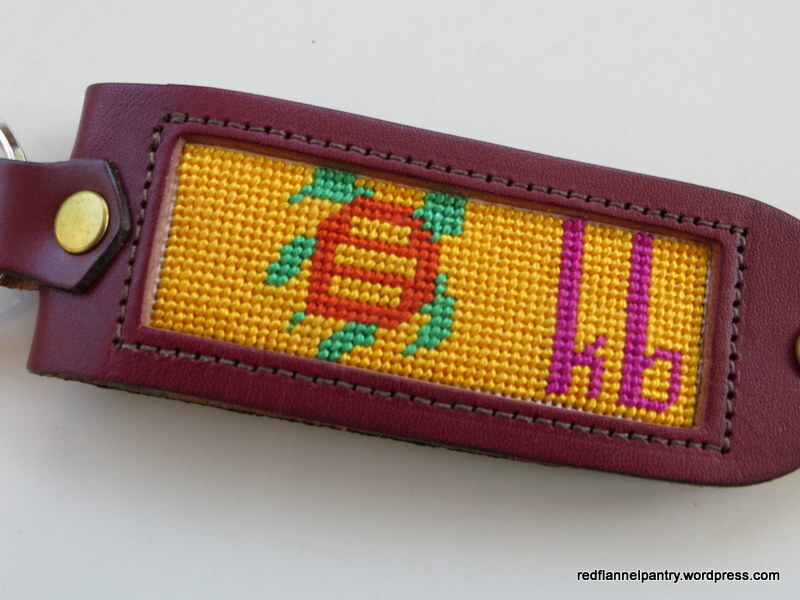 Yet another of Daughter #2’s friends has turned 16, so we needlepointed a special keychain in honor of the occasion. 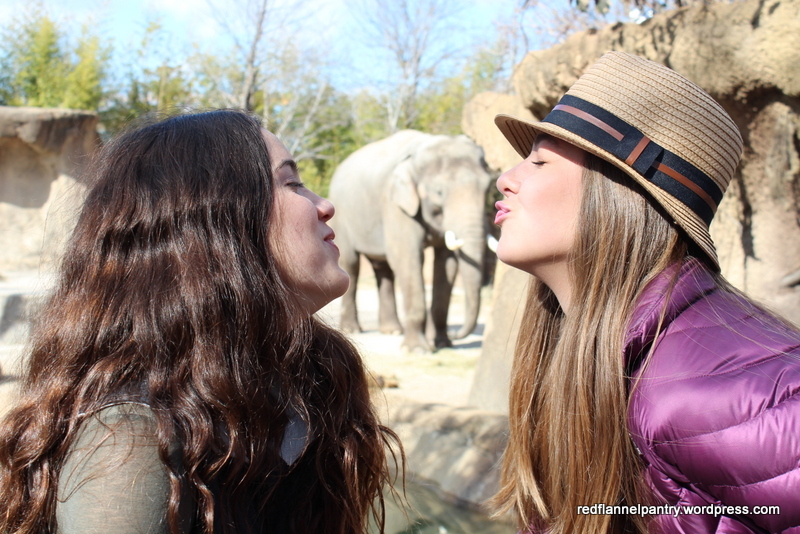 She is fond of elephants, so we made sure one landed here. 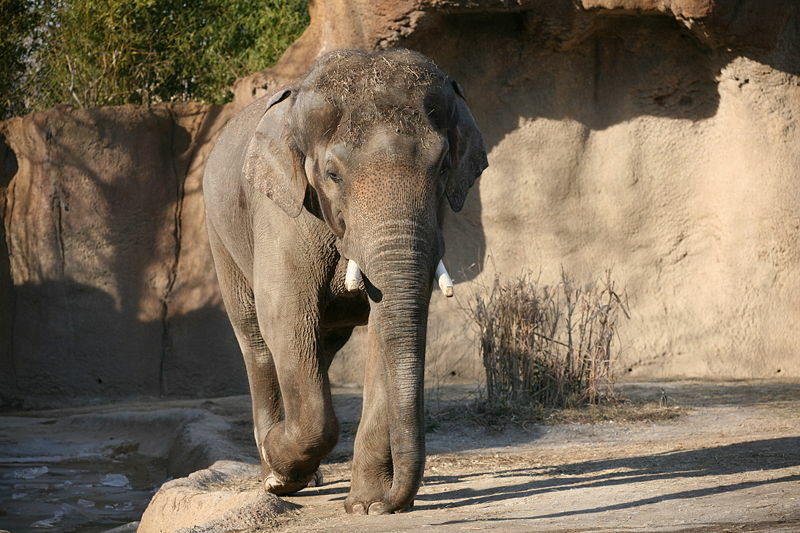 We are awaiting the arrival of the fourth baby of this big guy, Raja, at the St. Louis Zoo. 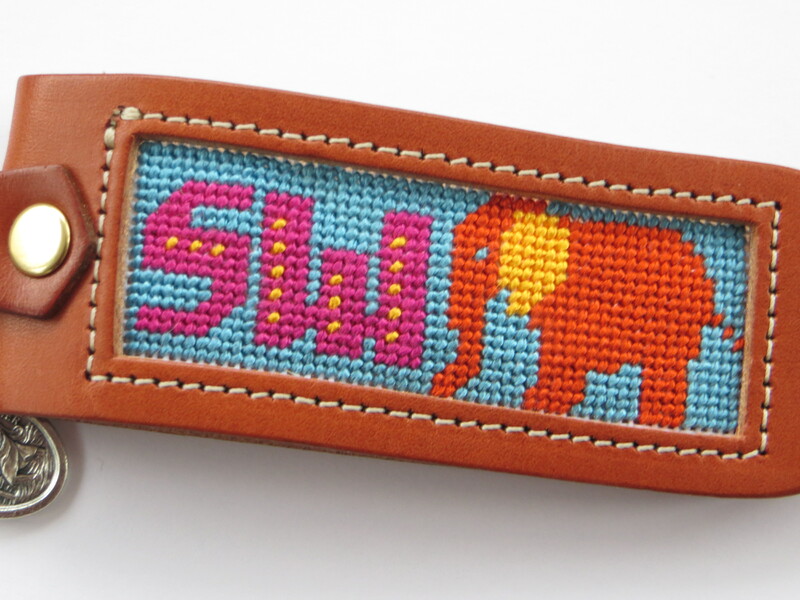 Ellie, the mother, is due any day now, so a needlepoint elephant is timely. 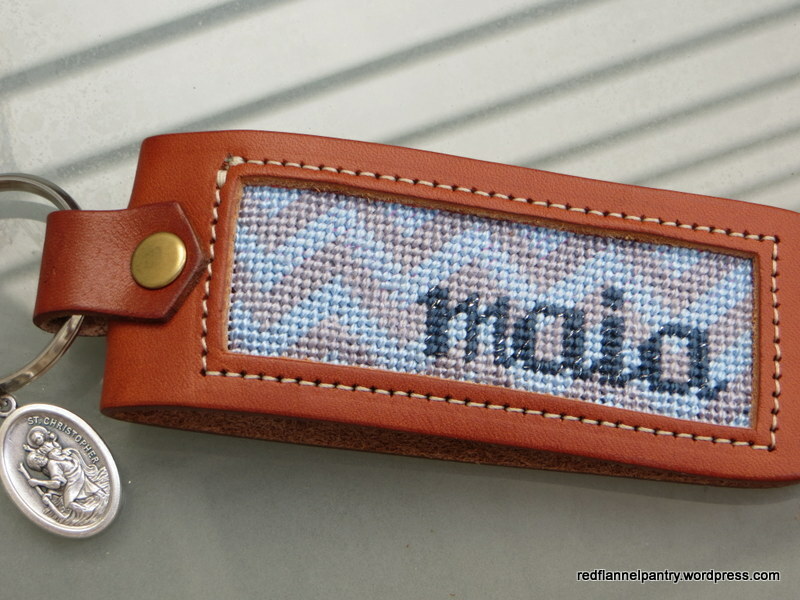 Daughter #2 and I have a keychain in the works for one of her friends. Although we have the design somewhat worked out, we were stumped by colors to use. Time to look at Design-Seeds! Design-Seeds is the work of Jessica and features photos with corresponding palettes of colors pulled from the photo. The photographs and their palettes range from luscious with rich, deep tones to meditative with calm, cool hues. Jessica posts a different photo everyday, so the website offers a daily treat for the eyes and mind. It’s a great way to start a creative day. 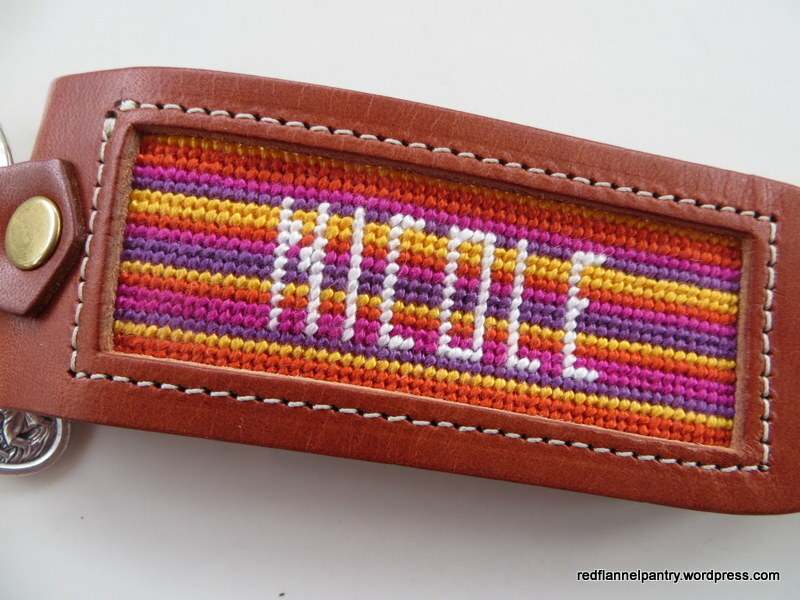 My daughters and I find the website helpful when seeking color inspiration and when searching for complementary colors when our hearts are set on using a particular tint. 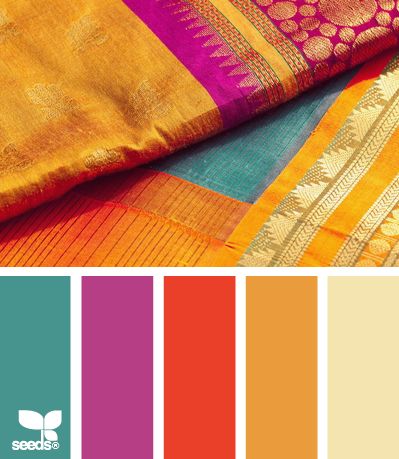 In this case, D#2 and I are taken with these sari-inspired, jewel-saturated tones. 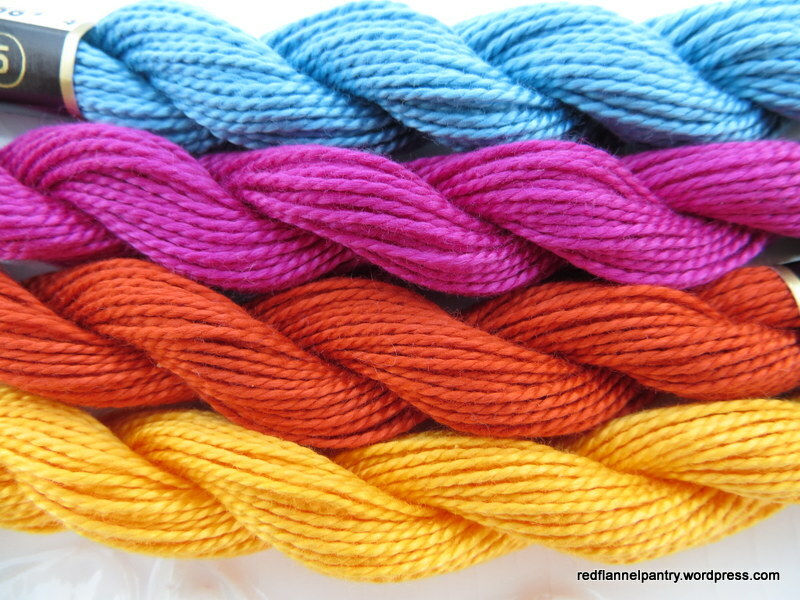 Jessica named this palette silk brights. 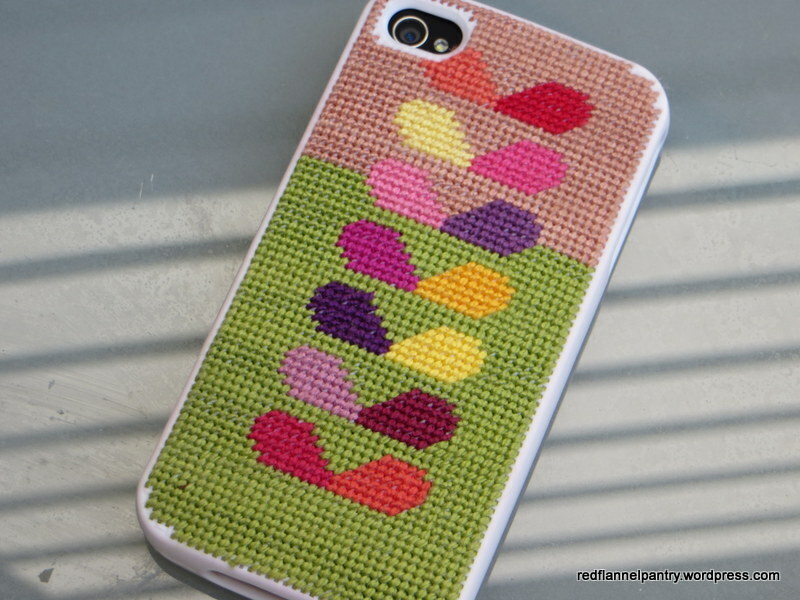 Here’s our interpretation based on our tastes and what was available at the needlepoint store–lovely. To celebrate the 16th birthday of her running partner and pit orchestra friend, Daughter #2 and I collaborated on yet another keychain design. It had to have some yellow and should be clean and bright–and wouldn’t it be nice to incorporate some little flowers? Edelweiss anyone? So we came up with this little pattern. Its subdued palette and sweet stylized flowers (although not white) suggest retro–Sound of Music.